Using Bell Media’s unique ability to advertise to your customers on their mobile devices we can help you target exactly who you want when you want and where you want. By layering in location and time based data with behavioral characteristics we help pinpoint your potential customers. Our product is unique in our industry, as we have our own proprietary tech stack, including our Demand Side Platform (DSP) and Mobile Data Management Platform (DMP). This means we will only use 1st party data to execute your campaign, which is the highest quality data any supplier can provide. Most others use 3rd party data. 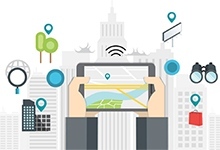 Our platform was built to understand location data, specifically historical geo-pattern behavior. This allows us to be more accurate with the audience that we are serving ads to. We have access to over 200K applications to serve your ads. 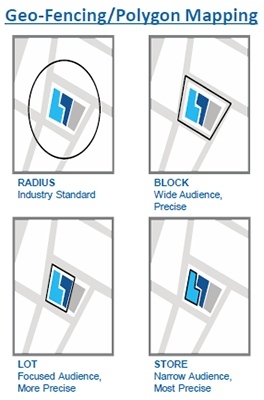 Geo-Fencing/Polygon Mapping - Custom Polygon geo-fences at scale, offering sophisticated and flexible targeting precision. Historical Geo-Targeting - Geo-target locations and events up to 30 days in the past to coincide with current live geo-targets. We can also target devices that show frequent historical geo-patterns. Verified Walk-ins - Reporting on the number of devices that received your messaging and in turn physically entered a POP location. This metric, in addition to the eCTR will provide great insight into the effectiveness of the mobile efforts to drive traffic to retail while also measuring general awareness and engagement. Behavioural Targeting - Targeting devices that show a frequent geo pattern in particular locations (e.g. at high end retail stores, frequent fine dining restaurants, etc.) or show a geo pattern of participating in certain events. We can layer in additional behaviours too! So what can our Mobile Advertising do for you? Detailed Reporting provided during and post campaign. This is a very unique opportunity with lots of layers. To learn more about everything we can do with Bell Media Mobile advertising or any of our other Bell Media advertising properties in Saskatchewan, please contact our sales department via our General Sales Manager Derek Ryan by email or calling 306-380-7718.